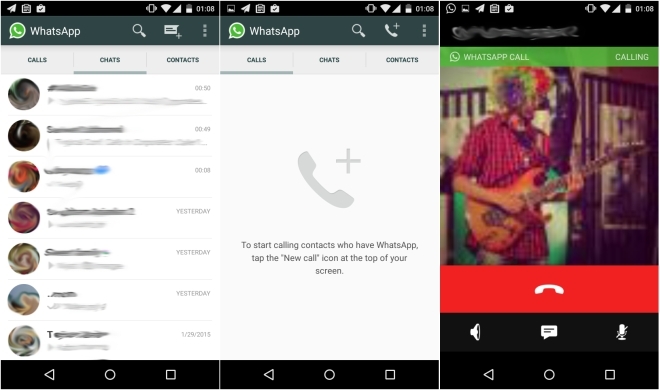 The free voice calling feature on WhatsApp has finally been rolled out to a few users India which appears to be available on invite-only basis, as of now. The invite-only basis basically means that users will get a call through WhatsApp from someone who already has the feature updated. The feature is also restricted to Android only and you will need the updated 2.11.508 version to access the app. Last month, WhatsApp released WhatsApp for Web users which simply mirrors whats’s on your smartphone to the screen. WhatsApp for web is currently available through the Google Chrome browser and also supports Android, BlackBerry and Windows Phone. However iOS users can’t access WhatsApp for web. WhatsApp, recently revealed that the app has 700 million monthly active users and that over 30 billion messages are shared on WhatsApp everyday. With voice-calling feature coming soon, it’s likely that WhatsApp’s engagement number will rise further.